It literally means a large “Champak Tree”, is a large sacred grove of India of the Soliga people. 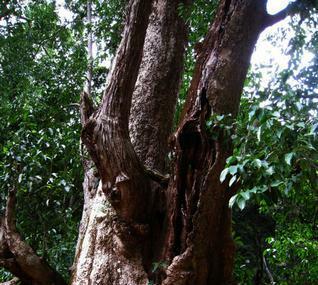 The tree is considered to be quite a few years old and provides protection and shade to several sacred lingas that are worshipped in the area. Located on the banks of the river “Bhargavi”, it sees festivities and celebrations during Shivaratri. The place blossoms into red and yellow colored flowers in the month of April, giving the whole canopy a bridal look. Legend says that for the Soliga tribe Dodda Sampige Mara is a deity who performs the fire dance during Mahashivratri. The tree symbolises the relation of the local tribes with Mother Nature. A lot of fun and adventure activities can be enjoyed around this area. Wear comfortable shoes for walking in the groves. Be careful of the wildlife around. Carry a cover to protect yourself from the insects around. The grove is open to visit at all times. Visiting it during the day is recommended. Bus: KSRTC Bus Services and TNSTC Bus Services ply till the BR Hills. Cab/ Car: Cabs and cars can be booked or hired to reach the groves, which are 4 kilometers away from the Hills. Love this? Explore the entire list of places to visit in Bandipur before you plan your trip. Fancy a good night's sleep after a tiring day? Check out where to stay in Bandipur and book an accommodation of your choice. How popular is Dodda Sampige Mara? People normally club together Kandal Cross Shrine and Brt Wildlife Sanctuary while planning their visit to Dodda Sampige Mara.